SDG is excited to be a part of the Farm Fresh RI Food Hub team! We’re helping renovate a brownfield site in Providence into a new local food production, distribution and market space. Our landscape design will add space for outdoor farmers markets, events and everyday improvements. Learn more about what’s to come in the links below. The February 2018 issue of East Side Monthly featured a column about the Blackstone Parks Conservancy and their efforts to expand and improve the active stretch of urban forest along Blackstone Boulevard in Providence. As chair of the committee, Colgate Searle has been contributing landscape architecture work to this initiative pro bono, and is quoted in the East Side Monthly column. So far, his work has involved assessing the conditions of the trees along Blackstone Boulevard to establish best planting practices in the face of the changing climate (plant hardiness zones are beginning to shift across the U.S.) as well as assess the path design and current conditions to work towards increasing the safety and quality of transportation for pedestrians, bicyclists, and drivers alike. Searle Design Group has teamed up with SMMA to design the stage two proposal for East Providence High School. The building, designed by SMMA, features flexible, inter-disciplinary learning spaces for the 21st-century student. The surrounding landscape, developed by SDG, includes various athletic fields, parking and vehicular circulation, and outdoor seating areas and plantings. The building and site work together to provide students with a vibrant and engaging learning environment. To learn more about the proposal, view the January 23rd City Council Meeting. The stage two application was recently submitted to the Rhode Island Department of Education (RIDE) for approval, stay tuned for more project updates to come! Tillinghast Farm is a beautiful coastal property in Barrington, RI owned by RISD. For the landscape architecture department, it serves as an outdoor studio for first year students to learn about soil, topography, tides, and the phenomenological environment firsthand. It is also the home of RISD's continuing education program which is in need of better facilities. SDG has been asked to work on a plan which improves handicap access and pedestrian as well as vehicular circulation so that the program can grow and serve a wider community. This project will look at both the current and future uses of Tillinghast Farm, and as a coastal property, the design must also prepare to respond to the challenges of climate change. SDG is currently working on several variations of how the property could be laid out to accommodate the wide range of needs. And stay tuned - new pictures of recently completed RISD projects and the North Burial Ground at Swan Point Cemetery are coming soon!! We've got several projects on the drawing table so make sure to catch all the action by following us on instagram (@sdglandscape), facebook, and twitter (@SearleDesign)! #ProjectUpdate Brown OMAC Project Nearing Completion! 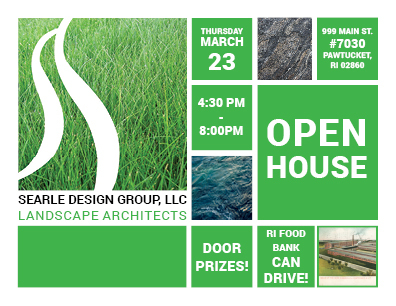 Searle Design Group has been engaging in research on climate change and how it impacts Rhode Island. Last September SDG designed and built an educational installation about sea level rise in the ocean state for PARK(ing) day Providence. During the event, SDG spoke to many community members about their hopes and concerns for the future of the Ocean State. This inspired a deeper investigation into the unique challenges Rhode Island will face as sea level continues to rise and climate patterns change. This expanded research has resulted in the development of a catalogue of design strategies for coping with sea level and flooding as well as a matrix of applications for these strategies. Our conclusion so far - our little state needs to start thinking a lot bigger. This means shifting the conversation from one about sustainability (the static maintenance of existing conditions), to one about resiliency (the dynamic ability to recover faster and better from disaster), and thinking systematically to plan for worst-case scenarios. We need to do more than provide children with opportunities to play in nature, we need to teach them how to protect it. That is the purpose of the 'No Child Left Inside' movement. Research has shown the beneficial impacts of natural learning environments on the development and well-being of children, but kids need to do more than just connect with their environment - they need to learn how to protect it for future generations. As the global push for green energy gains momentum, it is critical that we prepare the next generation of ecologically-conscious citizens to address the environment and the economy of the future. At Searle Design Group, we have had the opportunity to work on many educational projects for all ages, such as the Wheeler Farm master plan, and hope that these spaces may inspire the next generation of environmental stewards. A future landscape architect participating in our installation about Sea Level Rise for PARK(ing) Day last fall. These honey bees are pollinating 'Walker's Low' (Nepeta racemosa) at the Roger Williams Park Botanical Center. (SDG 2010). Pollinator species populations, such as the vital Honey Bee, are declining at alarming rates. Intensification of agriculture, pollinator habitat fragmentation and habitat loss are all factors which have negatively impacted native pollinator populations. If populations continue to decline, crop production could decline with it - causing a spike in food prices. 10% of Rhode Island's total land acreage is devoted to Agriculture. Rhode Island is a leader in direct sales of produce from farms to consumers. Agriculture (including livestock, dairy, aquaculture, nursery and greenhouse stock, vegetables, and sod production) contributes significantly to Rhode Island's economy. Help Educate your friends and family - spread the word about pollinator loss and why it matters. SDG Among ASLA's "Unsung Heroes"
The American Society of Landscape Architects circulated a survey among its Professional Practice Networks asking members to identify the firms they most admire. Searle Design Group came up among the list of lesser-known practices. 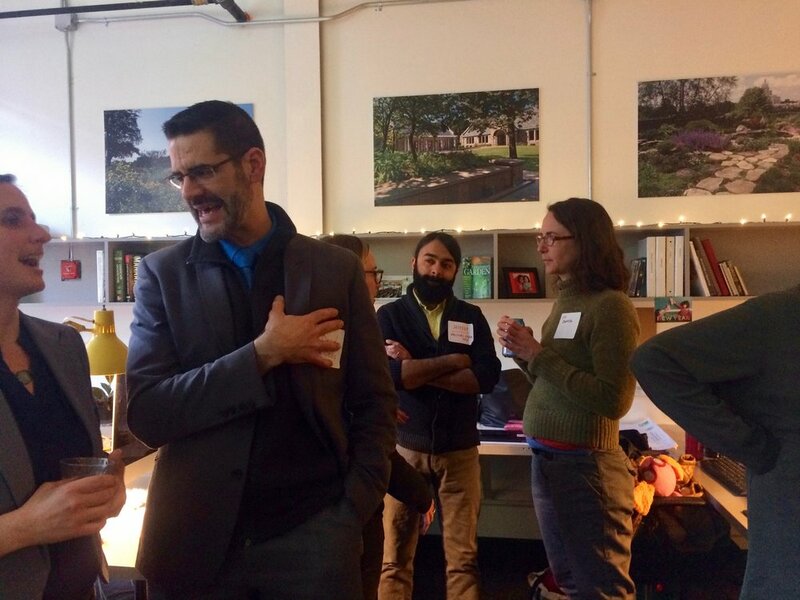 "Members identified general categories of practice that often go under-recognized, such as 'the nameless public realm landscape architect' and the educators and mentors who shape and encourage up-and-coming landscape architects: 'The greatest unknown (or unheralded) landscape architect is the one who reaches out and has a positive impact upon educating the next generation.'" Education has always been at the core of SDG's practice. Pictured below, Founding Principal Colgate Searle critiques RISD student's work at Harvard Forest in Petersham, MA (Summer 2015). New steps and paving have been completed at RISD's Ewing Multicultural Center - a real safety and accessibility improvement! After planting the job will be complete. Spring is in full bloom and the pavers are in place for the new urn garden outside the crematorium at Swan Point Cemetery. A dry-laid stone sitting wall wraps one corner, book-ended by large boulders like those found in the perimeter wall built by the Olmsted brothers in 1910. As one of the nation's oldest garden cemeteries, the design of this addition is intended to provide a serene setting for a form of burial that is increasingly in demand. As Chairman of the Blackstone Boulevard Park Committee, Principal Colgate Searle has been tasked with creating an inventory and maintenance manual addressing issues of sustainability as the park begins to change in the face of global warming. Blackstone Boulevard was originally designed as a corridor for streetcars connecting to the Swan Point Garden Cemetery, and is now a popular route for joggers and dog-walkers. SDG has been working to inventory and map all tree species and their conditions as well as identify areas for improvement pertaining to erosion and drainage on the paths. Part of the proposal for the park's future is to expand the boundaries to include the street trees on either side, creating a complete segment of urban forest. Colgate recently presented the park's fascinating geologic history (see below) to the members of the Blackstone Parks Conservancy. Open House Highlights and 10K Small Business! Thank-you to everyone who came out to celebrate our new office space! And a special thank-you to those who contributed to the 50 LBS of canned and boxed goods we collected for the Rhode Island Food Bank! For those who couldn't make it, check out the highlight reel from the event below! We are also excited to share that we have been accepted into the Goldman Sachs 10,000 Small Business program hosted by the Community College of Rhode Island this summer! This program provides educational classes and workshops on business growth, as well as access to capital and a network of support to a competitive selection of small business leaders. Searle Design Group is proud to announce we are now Women Business Enterprise certified in Rhode Island (Massachusetts comes next)! Top L to R: Principle Taber Caton, Principle Colgate Searle, Associate Principle Melissa Bagga. Bottom L to R: Intern Rebecca Ladd and intern Jess Wilson. Searle Design Group LLC has worked with Swan Point Cemetery - the largest green space in Providence - for over 20 years. This historic, 200-acre cemetery was one of the first "garden cemeteries" in the country, and one of SDG's objectives over the years has been maintaining its elegant historic character while facilitating necessary expansion. 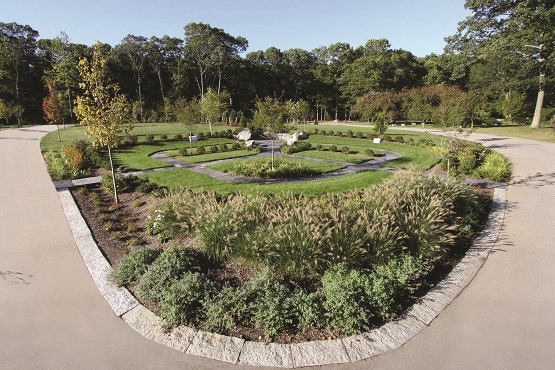 Last summer, SDG seamlessly implemented a burial plot expansion into the subtly rolling topography with permeable paving, native plantings, swales and a series of check dams addressing environmental concerns related to an adjacent wetland. This week, plans went out to bid for a new cremation garden and burial plots within the expanded area. Swan Point recognized a trend toward cremation over traditional burial in recent years, so they asked SDG to create a serene, contemplative setting. SDG's design incorporates schist pavers and artfully arranged boulders paired with a colorful planting palette to create spaces for reflection and celebration. For those of you who missed it, SDG was honored to be included in the February 17 issue of Providence Business News. Read the article here.